The establishment's choice is David, Lord Sainsbury of Turville, who I've discussed in a previous post. Mary Beard suggests that this nomination reflects 'relative meritocracy'; the implication is that this is because he's donated more than £82 million to the university. I don't quite understand this, I have to say. I'd love to be in a position to donate £83 million to the university and become the new Chancellor. Fact is, I don't have that kind of money. But I don't see why being rich (and hence able to donate vast sums of money while still living in a manor house) means that Sainsbury is the best man for the job. Sadly, to be rich, at least in this country, you usually have to either be born into it or step on the little people's toes. Neither, in my opinion, qualifies one to be the titular head of the world's best university. 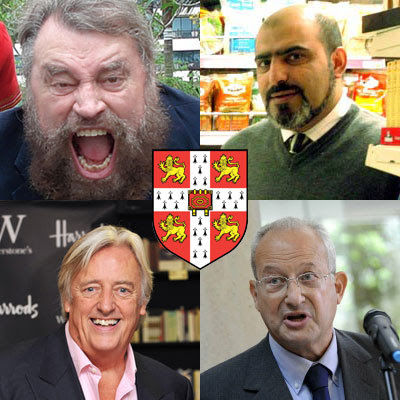 A group of disaffected alumni (and me) have nominated actor, author and mountaineer Brian Blessed. There are various reasons to vote for him, some of which, again, I feel have been misunderstood. 'What happened to radical politics eh?' asks Mary Beard. Well, let's get one thing clear: voting for a supposedly apolitical choice over a radically political choice is a political decision in itself. And in my previous post I argued that Sainsbury would be a radically political choice simply by virtue of the message his election would send. However, for those of you who want a more political choice, there's Michael Mansfield QC. A lawyer famous for representing the little guy in famous court cases, he's made no secret of his left-wing leanings. His nomination originates from some of the academics involved in the Cambridge Defend Education campaign. He welcomes the 'opportunity to defend the principles of Higher Education and critical thinking in particular, which have been steadily eroded by successive governments wedded to market forces'. I'm probably going to vote for him on that basis alone, since he fits the criteria laid out in my previous post perfectly: 'a public figure who's shown support for the general principles of the Defend Education campaign, and in particular opposes the marketization of higher education and research'. Last but not least we have Abdul Arain, owner of Al Amin grocery store on Mill Road. A one-issue candidate, perhaps, since he's standing in protest at the plans for a new Sainsbury's in the vicinity. Still, I'll be clear that I'm in complete support of independent businesses in Cambridge, and welcome his candidacy on that basis alone. Also, his being elected would add plausibility to his website's claim that Al Amin is 'much more than simply a place to shop'. The Guardian has an interesting piece on his motives and support. Though I find it weird that he claims that 'Most people know me at Cambridge, both town and gown'. I for one had never heard of him before his nomination, and I suspect I'm not alone in that. So the elections themselves will take place at the end of October, according to this Wikipedia article, by Single Transferable Vote. We'll have to rock up to the Senate House in person. Perhaps wearing gowns (lol). Hopefully there'll be no disgraceful electioneering on the part of the University administration this time, as there was with the ballot on Grace 1 of 23 February 2011, when the head of the English Faculty sent an email to all Faculty staff asserting, without any argument, that "a 'non placet' vote would institutionally be near suicidal".